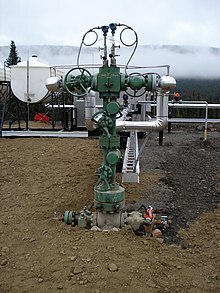 In petroleum and natural gas extraction, a Christmas tree, or "tree", is an assembly of valves, spools, and fittings used to regulate the flow of pipes in an oil well, gas well, water injection well, water disposal well, gas injection well, condensate well and other types of wells. It was named for its resemblance to the series of starting lights at a drag racing strip (Christmas tree (drag racing)). API Specifications 6A and 17D. This page was last edited on 16 February 2019, at 15:45 (UTC).